SAP Business ByDesign cannot give legal advice nor can we assess the future best practices of how the professional services industry or customer projects taking IFRS 15/ASC 606 regulations into account are to be handled. It is quite common in the professional services industry for clients to manage project related travel and expense transactions. This case document focuses on managing travel and expense transactions as they relate to the SAP Business ByDesign enhancements for IFRS 15/ASC 606. Example: Media Productions Limited has agreed to run a project with Printing Solution Corp as consulting partner to identify optimization potentials for the existing printing facilities in the East Region and in the West Region They agree on 2 separate deliverables: optimization document for printing facility in West Region and East Region. The travel and expenses for the consultants are to be handled in a dedicated sales item for passing the expense through. The travel and expenses generated by the consulting team are assigned to the project summary task in this example. For simplification reasons, it is also assumed that sales order items 10 and 20 and the assigned project tasks are completely fulfilled and invoiced in the second period Travel and expenses are posted in period 1 and 2. Printing Solution Corp has agreed with Media Productions Limited that the travel and expenses are passed through. Passing through means for example 1000,- USD incurred for flight, hotel, per diem allowance will be charged 1:1 to Media Productions Limited as an invoice, in this case 1000,- USD would be invoiced for travel and expenses. Exclude Option on sales item level: From a IFRS 15/ASC 606 standard point-of-view it can be assessed that this item of the contract is to be excluded from revenue allocation because it is not intended to generate revenue. 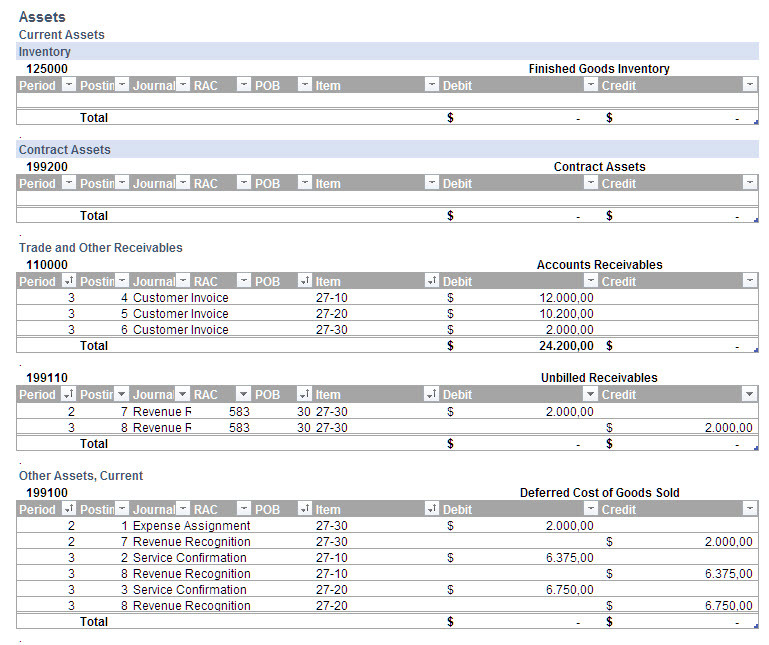 SAP Business ByDesign IFRS 15/ASC 606 functionality offers the capability to exclude sales order items from the allocation basis. 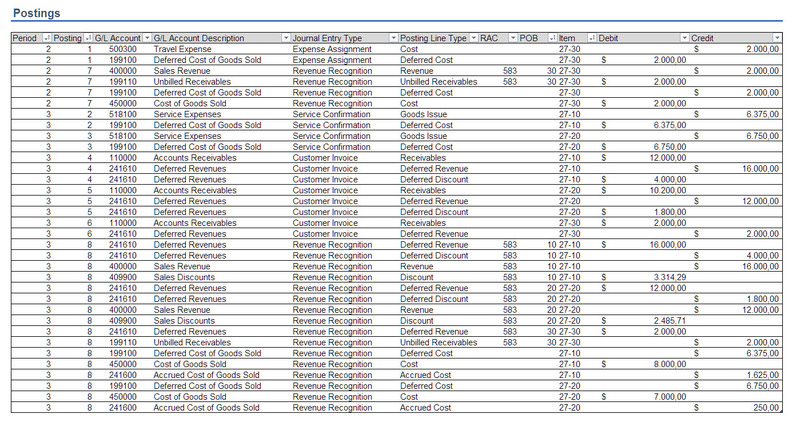 For item types of ‘expense products’ the exclude option in the sales order item is switched on by default. The illustration below shows the sales order with the revenue accounting contract, the performance obligation assignments including the flag to exclude the travel item. Every sales order item is assigned to one separate performance obligation. For the fixed price items, the ‘cost estimates’ on sales order item level have been maintained. The excluded flag is set for the expense product being used to invoice 1:1 the incurred travel and expenses. The system uses the Quantity = 1 and the List Price as the estimated overall travel and expenses costs. This price is also passed as SSP – though it will have no impact on the allocation. What are the implications for the revenue accounting contract and the allocation basis? Accrual methods: The Travel and Expense Line Item on the Sales Order was flagged as “Exclude” therefor this line is subject to ‘regular revenue recognition’ and will thus be assigned the accrual method ‘recognize at point of delivery’. If agreements are in place to charge on top of the travel and expenses an overhead surcharge (eg. 5% for admin) the travel and expenses can be handled as illustrated above. It is recommended that the client consult with their respective auditor to confirm the specific situation. Following the previous example, it is assumed that the travel and expense item is charged 1:1 and it is confirmed to exclude it form the allocation basis from the revenue accounting contract. In the same basic scenario Media Productions Limited and Printing Solution Corp have agreed on following terms concerning the travel and expense item in the sales order. Travel and expenses have to be treated as a fixed price item. It includes 2x visits, 2 consultants at both locations for 2 days per stay. The transaction price has been agreed to be 7500,- USD with an upfront invoice. How is this to be treated according to IFRS 15/ASC 606? – The typical solution is that the sales order item includes a regular POB as it can be assumed to generate revenue. The standalone selling price is determined and the item is part of the regular allocation basis of the revenue accounting contract. In addition, a suitable accrual method needs to be determined or assigned. Note: SAP cannot give legal advice on handling of this simplified travel and expense case. It is recommended for customers to consult with their auditor on the impact of IFRS 15/ASC 606 on this item. For this case, no posting example will be provided. In case it is to be treated as a regular performance obligation, the handling is the same as illustrated in previous case documents for project sales. We will focus on the posting example using the pass-through scenario without markup. The sales order is created. The travel and expense item is flagged to be excluded. The revenue accounting contract reveals following allocation basis. Travel and expenses have been recorded by the consultants as agreed with the project lead to the project summary tasks. The project lead forgot to assign the recorded expenses from the ‘not invoiced time and expenses’ pool to the travel and expense sales item in period 2. 2000,- USD Travel and expenses have been recorded. 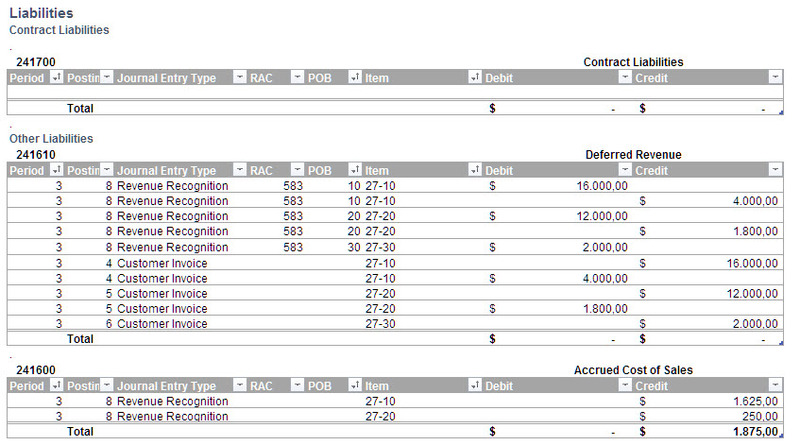 The revenue recognition run has following basis after period 2. POB 10 and 20 have not started. POB 30 = Sales item 27-30 Travel and expenses is excluded. No allocation takes place. But the accrual method has been set to: ‘at delivery’. Therefore, the COGS are fully realized. The simplified journal entry is depicted below. The consulting team executes completely both project tasks and finalize the 2 documents. The journal entries from time confirmation are shown below. The project lead confirms that all recorded times are to be invoiced and triggers a final invoice for both sales items. In addition, the project leads assigns the travel and expenses recorded in the prior period to the sales order item 27-30 Travel and Expenses and triggers an invoice for travel and expenses. The simplified journal entry is shown below. The revenue recognition run is executed for period 3. Sales order items 10 and 20 are completely fulfilled and thus show 100% progress. Revenue is fully recognized. The excluded item 27-30 for allocations from the revenue accounting contract is also realized according to its accrual method: ‘recognize at point of delivery. See the simplified journal entry. The revenue and COGS are realized. 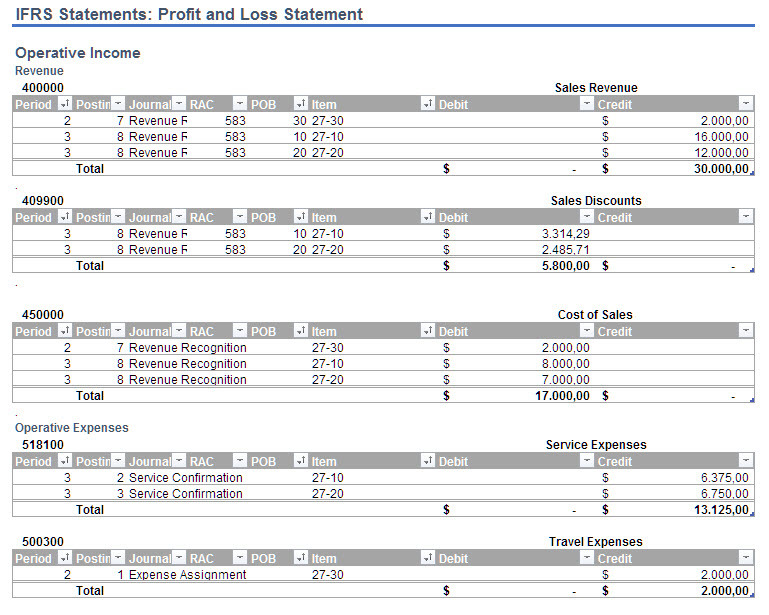 The deferred revenue and deferred cost of goods sold are cleared.